Who wouldn’t be into the idea of taking something crisp, like a toasted slice of sourdough or a broken seed-covered cracker, and spreading it thickly with fresh sheep’s curd? If someone offered me that, I would think it were almost perfect and I would take it. Add some flaky salt and good olive oil and that’s it. 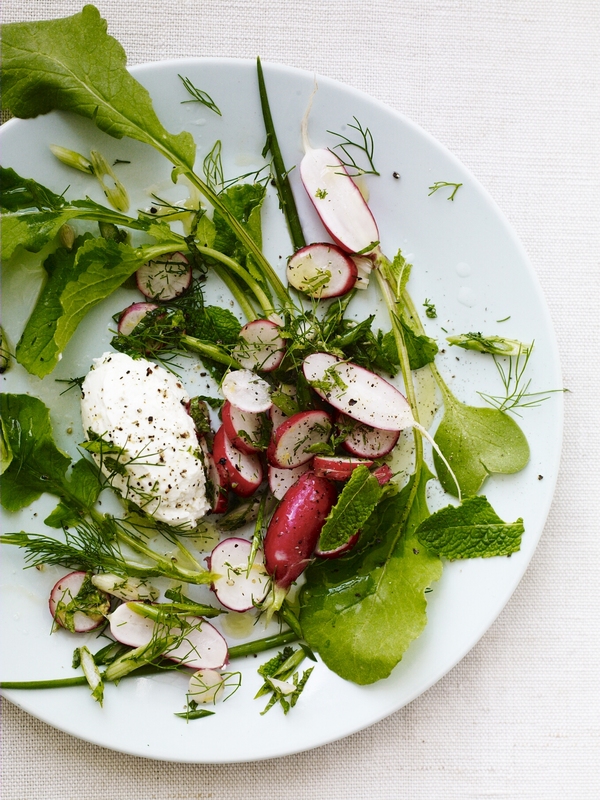 This salad, beautifully fresh and simple to assemble, is based on the same notion, pairing a smooth and rich curd with something undeniably crunchy – new season, firm, red radishes. Fresh garden herbs and lemon add a beautiful fragrance. Wash the radishes, then give them a quick trim if they need it, removing any tired leaves from the green tops. Using half of them, slice the roots across their circumference into rounds of 1–2mm (1⁄16–1⁄8in) thick. Place the radish slices in a bowl, and set aside the tops. Trim any roots from the spring onions, then thinly slice the white bulbs and most of the green stems at an angle. Add the onion slices to the sliced radish. Chop half the mint leaves and half the dill and stir them through the radish and onion mixture, along with 1 tablespoon of the olive oil, half the lemon juice and a little of the lemon zest. Season with salt and pepper, then stir again. Cut the remaining radishes in half from root to tip, trying to keep the green leaves attached to each half. To assemble, place a spoonful of curd on a plate. Arrange half the radish halves and the reserved tops around the plate, then scatter over half the dressed radish and onion mixture. Repeat for a second plate. Tear over the remaining dill, then scatter over the remaining whole mint leaves, olive oil and lemon juice. Season again with salt and pepper, then serve straight away.